I have a 556 SWAT pistol that I SBRd. I just recently purchased the SIG Aluminum lower and the clamp on rear... Its getting pretty close. 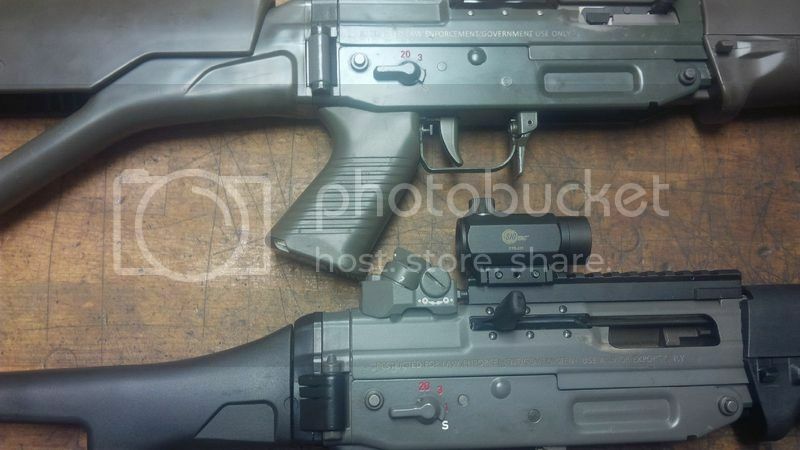 Anyways, I was looking at getting a set of the carbine handguards and ditching the rail. 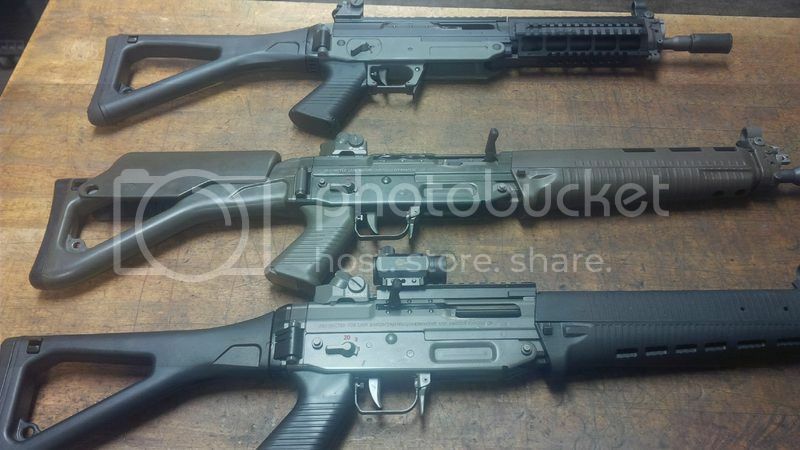 Will I need the handguard cap by the FSB as well as the handguards or are they drop in as is? Also, I have 4 sig mags but wondered if anyone had a line on anything cheaper than the $40 or so that SIG is charging? Any Idea what the value of my old SWAT lower that accepts AR mags and Buffer tube extensions? < 100 rds..
Last. What Height riser am i looking for on the Sig T1 knockoff? Wish I got to handle real sig MGs! I think you will need the HG ring. Are your handguards US or Swiss? The lengths are different. Lower value? Not sure. Check GB. Personally I'd keep it just in case. JMO. Mags? Check RiverofGuns. You might find an old listing for mags or a post that tells you where to find them. Not sure about riser height. You can buy the "classic" style handguards for your pistol from Sig. I think they were around $80 shipped. I chose the third option... it was very expensive. Thanks for the reply. Great looking gun. It's what I'm going for. Is the OEM cap a lot different then the gen 1? I assume you mean the Swiss SAN 552 / 553 handguard retainer cap vs the US 556 retainer cap? Yes they are quite different in shape and depth, due primarily to the vast difference between the US 556 handguards and the Swiss SAN handguards. The US 556 handguards look similar to the Swiss 551 handguards (rear palm swell, etc.) and when those handguards are cut down to fit a US 556 pistol / carbine their profile does not resemble the Swiss SAN 552 / 553 models in the least. The gen 1 US pistol / carbine handguards were a stopgap solution and they are kind of hinky in my opinion. The latter second gen handguards that are purpose made for the longer US gas system are infinitely easier to install and remove. Neither look like the Swiss SAN stuff though... they are made from completely different material with a completely different pattern and finish. But they are much cheaper and I imagine you could call Sig USA's parts department and still order them. Also if you go the original 550 cutdown route as I went you might want to try to find a DDLES handguard cap. That is what I inevitably ended up with. It has a much nicer fit than an original SAN cap with the longer US pattern handguard cut position, which has some up / down movement with the SAN cap. Yes and it is not that difficult. Punch out two pins and slide the gas block off the end. Install in the reverse.